Hello! Happy Friday and Happy August! This summer is just flying on by isn't it? I'm trying to slow down and enjoy every moment! It's been so much fun so far! Last month I had so much fun with my Instagram challenges that I decided to take on a couple of more for August. I didn't hit every day last month and I don't necessarily plan to this month either, but it definitely has helped me on days that I struggle with what to wear and has made my "No Shop Summer" so much easier! 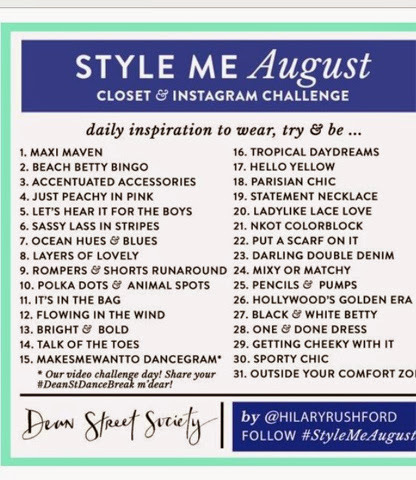 First up, I'm joining back up with Hilary Rushford and Dean Street Society for Style Me August. I love her style prompts - they are pretty simple and pretty broad so it's easy to interpret. Starting this month if you register with her on her website, she'll also email you a weekly inspiration list with style ideas for that week's prompts. I think that will be super helpful as I continue to work on remixing my closet! 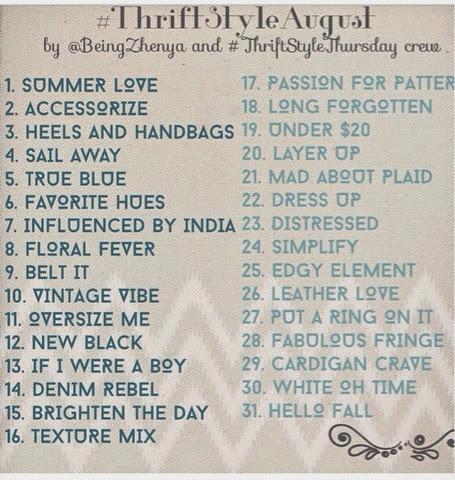 The second style challenge I'm taking on this month is with my fellow Thrift Style Thursday gals - aided by Zhenya of Being Zhenya, we are taking on an entire Thrift Style August! Again, the prompts for each day are pretty simple and broad - like today for example is Summer Love. Easy peasy! So anyway, I think these will both be fun challenges and I think they'll even mesh up with each other from time to time which is awesome! Once again, feel free to follow along with me on Instagram - BethieTheBoo. Let me know if you're playing along too! And in other news, today begins a week that is celebrating something you all know is near to my heart - it's World Breastfeeding Week. I am still a firm believer that however you choose to feed your baby is the best way - I have nothing against formula at all, you're feeding your baby, that is what is important. But, as someone who has been able to successfully nurse for almost 8 months and counting, I am very passionate about breastfeeding and raising awareness of breastfeeding - and also raising awareness of it being a normal, natural thing and not something that should be having to be hidden or considered taboo. A friend tagged me to this adorable graphic yesterday on Facebook and I had to share it because it just made me smile. I just wanted to send love and encouragement to all nursing mamas out there - it isn't always easy, but it is so totally worth it. I actually dread the day that we wean and I try hard not to think about it right now! If you know a nursing mama, make sure to give her some love and encouragement this week! And that's it for today! I hope you all have a fantastic weekend! In case I haven't said it lately, thanks for stopping by and sharing a little bit in my world! I didn't know it was national breastfeeding week! Maybe you'll breastfeed longer then you think. When I had my first, I thought I would be done by 6 months. I continued to breastfeed her once a day after she turned one until she was 23 months old (and I was 2 months pregnant). There were times that I wished she would be done with it all and wean herself. But I'm glad that I did it. I ended up cutting her off because I didn't want to have jealousy issues after the baby was born. Still breastfeeding my 7.5 month old and I will continue to breastfeed her until she weans herself and my supply keeps up (up until she turns 2 - I eventually want my body back! Lol). Have a great weekend! I really enjoy reading your blog and following you on IG! I didn't know there was a week for that! Pretty cool! I was lucky enough that both Henry and Eva were able to breastfeed. Now when I tell them about it, they get a little freaked out! Have a great weekend!! I definitely hope I can join in on Thrifting month! These challenges sound really super fun! And, you're right, simple and broad enough to interpret easily. 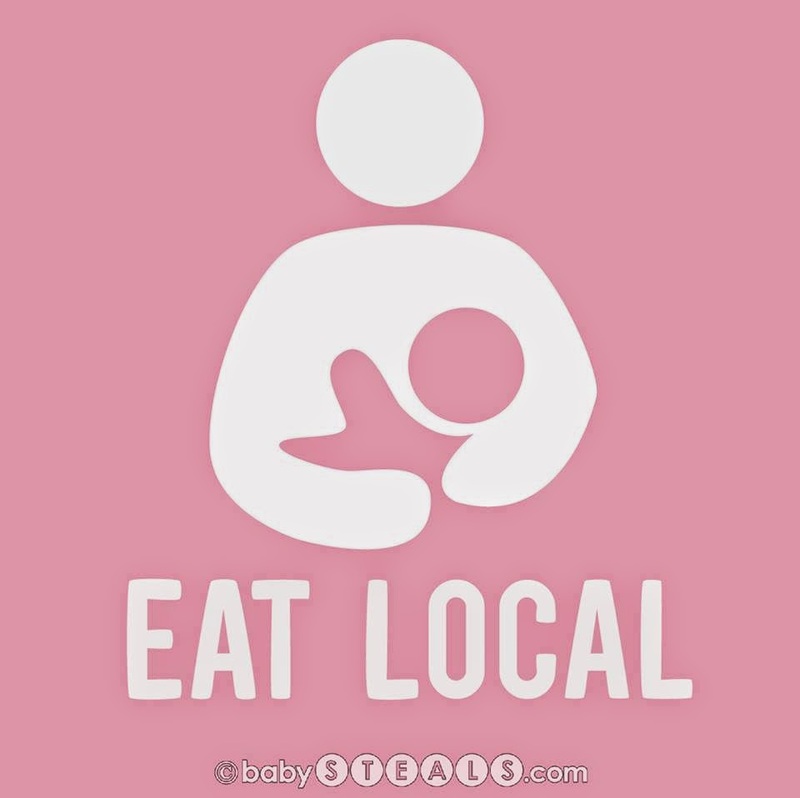 I am a big fan of breastfeeding, though I am still super shy about doing it in public. My sister will breastfeed absolutely anywhere. I think she is very brave and I commend her.